Given the huge impact the concept of Authorship has had on film history and film theory, it is highly surprising that few publications have dealt with it exclusively, the majority instead preferring to cite it as one theory amongst others. One book that does dedicate itself to the subject is John Caughie’s excellent Theories of Authorship, but, astonishingly, this is now over a quarter of a century old. Thus, the time is more than ripe for a new pretender to the crown to step forward- enter stage left Barry Keith Grant’s new book Auteurs and Authorship- A Film Reader. The whole concept of Authorship is a paradoxical one- superficially simple, but with an undercurrent of complexity that has spawned whole thesis and critical debate which can become so dense that the idea itself becomes subsumed ‘neath a fog of rhetoric. At its most simple level, an “auteur” (=author) is usually a director who exhibits a consistent thematic and stylistic approach across a body of their work. This basic notion, though, is complicated by widening the concept to include stars, producers and even studios themselves. Furthermore, it presupposes a snobbishly empirical point of view whereby certain directors become almost canonised for their consistency and woven tapestry of familiar themes and others are disregarded like used matches for not having this discernibly systematic approach. Intriguingly, as the term became used within film criticism in the 1960s largely thanks to Andrew Sarris, there was a tendency to look back rather than forward, meaning that many directors who started their careers in the 1970s have been overlooked when it comes to formal studies of their work. Given my two points thus far- that Auteurs and Authorship is a much overdue title and also that there is a need for contemporary authorial discussion; it would be tempting to assume that Barry Keith Grant presides over a book that has just that modern focus. Not so. Instead, he brings together key writings on the topic in a book of three main sections. Firstly, there is a chronological overview of the key articles which enables the development of auteurism to take place in its historical context. Secondly, the problems of limiting film authorship to merely a discussion of directors is firmly addressed through a range of articles from Roland Barthes’ landmark essay ‘The Death of the Author’ (1968) to Matthew Bernstein’s ‘The Producer as Auteur’ (2006). Finally, a section entitled ‘Close Readings’ presents studies of individual directors ranging from John Ford and Douglas Sirk to Dorothy Arzner and Oscar Micheaux. In essence, Grant’s book could flippantly have been titled Everything You Always Wanted To Know About Authorship But Were Afraid To Ask, as the vast majority of the core pieces on film authorship are indeed present within its pages. The one surprising omission is Alexandre Astruc’s groundbreaking essay Birth of a New Avant-Garde(1948) which embraced the idea of the camera-stylo which was a major influence on Truffaut’s A Certain Tendency of the French Cinema(1954), which is present. With the increasing numbers of books about almost every facet of cinema appearing on bookshelves weekly, the question of originality frequently raises its head. How much need is there for another book about Authorship if you own the Caughie volume? The answer is that there is great need- both, inevitably, contain some of the same material, but both too are different. The important thing about Barry Keith Grant’s Auteurs and Authorship is that it brings a very contemporary debate up to the present day as well as presenting some intriguing profiles whose disparate nature place them outside the remit of Caughie’s book. Overall, the books should be used in conjunction, be studied as a complimentary pair, and even take their place side by side on even the most meagre cineaste’s bookshelf. 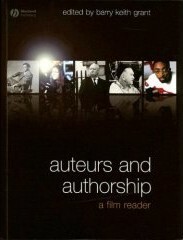 'Auteurs and Authorship- A Film Reader' is published by Blackwell.